Key chairmen met with the House general counsel in a bid to put any subpoena fight on firm legal ground. 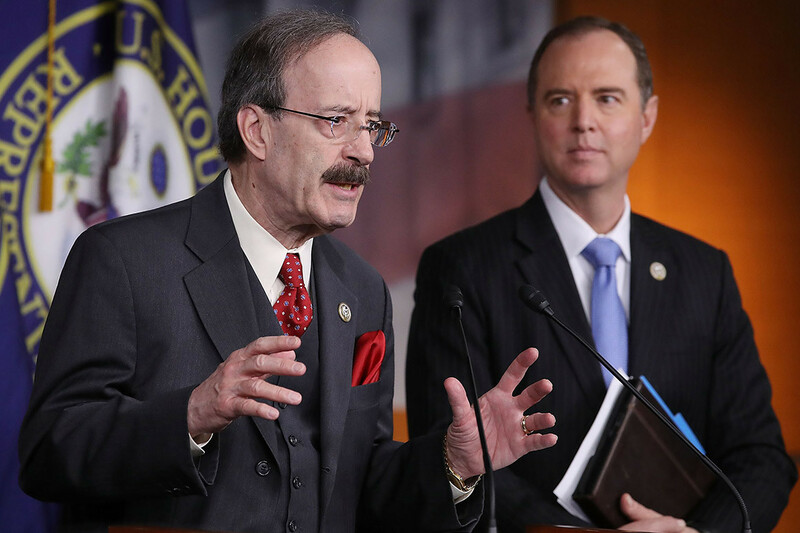 House Democrats are taking their first real steps to force President Donald Trump to divulge information about his private conversations with Russian President Vladimir Putin, setting up an extraordinary clash with the White House over Congress’ oversight authority. Rep. Adam Schiff, the Intelligence Committee chairman, and Rep. Eliot Engel, the Foreign Affairs Committee chairman, told POLITICO they are actively consulting with House General Counsel Douglas Letter about the best way to legally compel the Trump administration to turn over documents or other information related to the president’s one-on-one discussions with the Russian leader. “I had a meeting with the general counsel to discuss this and determine the best way to find out what took place in those private meetings — whether it’s by seeking the interpreter’s testimony, the interpreter’s notes, or other means,” Schiff (D-Calif.) said in a brief interview. It’s a development that indicates Schiff and Engel are close to taking action on the matter; key members of the majority party often consult with the chamber’s general counsel on issues that could end up playing out in court. Democrats want to ensure that they are on the strongest possible legal ground because they anticipate the Trump administration will mount spirited challenges. The move also underscores the seriousness with which Democrats view Trump’s conciliatory statements and actions toward Moscow and its place as a top House priority as the party pursues wide-ranging investigations into the president and his administration. In particular, Democrats say they want to find out what Trump and Putin discussed during their private meeting in Helsinki last July, where Trump put himself at odds with the U.S. intelligence community and declared — while standing next to the Russian president — that the Kremlin did not interfere in the 2016 elections. Trump’s remark prompted Democrats to call for Marina Gross, the State Department translator who was the only other American present for the Trump-Putin meeting, to share her notes with Congress and testify in public. Schiff and Engel have left all options on the table, including issuing subpoenas, which the White House would surely fight. Democrats acknowledge long-standing precedents about the sensitivity of presidential communications with world leaders. But they argue that Trump’s posture toward Russia and his efforts to conceal details of his private conversations with Putin are good enough reasons to pursue the issue with the House general counsel. “I’m not saying that I’m in favor of interpreters turning over all their notes, but I do think that it shouldn’t be up to the president to hide the notes,” Engel (D-N.Y.) said in an interview. A White House spokesman declined to comment. Democrats’ campaign to find out what Trump and Putin discussed began in earnest last month after a Washington Post story revealed that the U.S. president went to “extraordinary lengths” to shield his interpreter’s notes about a 2017 meeting with Putin in Hamburg from senior officials in his administration. At the time, White House Counselor Kellyanne Conway said the president did so out of concern about the information leaking. A Democratic aide familiar with the committees’ effort said the Post story prompted lawyers from the Intelligence and Foreign Affairs panels to sit down for a meeting to discuss how to get their hands on information related to those conversations. Schiff said his discussions with the general counsel centered on potential legal roadblocks, including executive privilege. The California Democrat, a former federal prosecutor, said his initial conversations with Letter suggest that Trump would not be able to legally claim such privilege to block House Democrats. Legal experts said the potential clash between the legislative and executive branches could result in the creation of entirely new precedents. While the courts have defined executive privilege as including conversations between a president and his or her close advisers, they have not weighed in on talks with foreign officials. “If this got to litigation, [the executive branch] would point to cases that contain language about the importance of foreign affairs and the president’s role in foreign affairs,” said Thomas G. Hungar, who served as House general counsel under Republican leadership from 2016 until last January. “They would try to say, for the same reason that the Supreme Court recognized communications between the president and his staff to be privileged, the court should recognize a similar privilege for communications with foreign heads of government because of the need for sensitivity,” Hungar said. Therefore, Hungar added, Letter is likely advising Schiff and Engel on the legal compulsion method that is most likely to be successful and does not harm the House’s “institutional interests.” Lawmakers are loath to take action that could undermine their ability to conduct effective oversight or see their efforts defeated in court. Engel’s panel has formed a new subcommittee focusing on investigations and oversight, while Schiff announced this month that his committee was re-opening and expanding the panel’s Russia investigation to include an examination of whether Trump is compromised by Moscow. Schiff previously called for Gross, the American translator present for the Trump-Putin meeting in Helsinki, to testify before the Intelligence Committee in private. Republicans rejected that demand last year when they controlled the panel. But now he’s got the gavel — a new reality that appears to irritate the president. Trump has publicly harangued Democrats for their investigative ambitions and has called out Schiff in particular on Twitter and elsewhere. During his State of the Union address, Trump warned Congress against pursuing “ridiculous partisan investigations” — a remark Democrats said amounted to intimidation even as they brushed it off.